Beautiful aubergine purple evening shoes by the designer Heavenly. An elegant closed toe shoe with feature scalloped detailing across the foot. Sling back evening shoes with an ankle fastening to elongating your legs and a diamante encrusted buckle for that touch of sparkle. 3" satin covered heel. 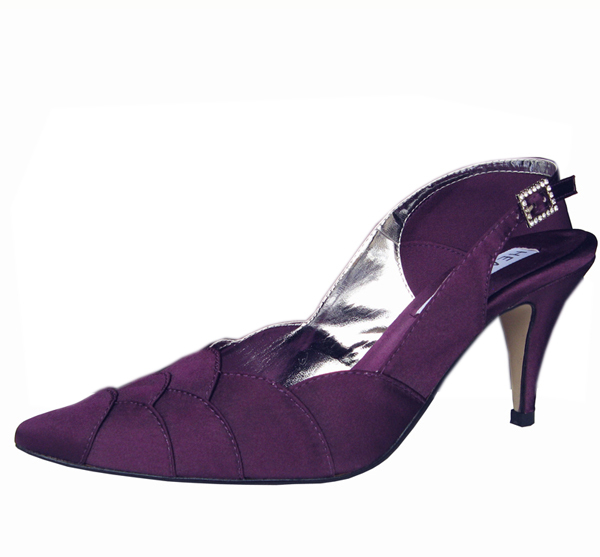 There is a matching aubergine clutch bag available to purchase seperately, to match these beautiful purple evening shoes. Purple matching shoes and bags are a beautiful finish for any outfit. I purchased the Selina Aubergine purple satin ladies sling back shoe with matching bag for a wedding and they were gorgeous! Beautiful colour and the shoes were very comfortable. Unfortunately I changed my mind regarding the outfit I was going to wear and therefore had to return them. I did tussle with whether to keep them or not as I LOVED them but decided that I almost certainly wouldn't have an occasion to wear them to in the near future, so they had to go back. The return was dealt with without any quibbles and I would certainly recommend Sole Divas to anyone and I hope to use them again in the future.